Tivoli Audio review | What Hi-Fi? 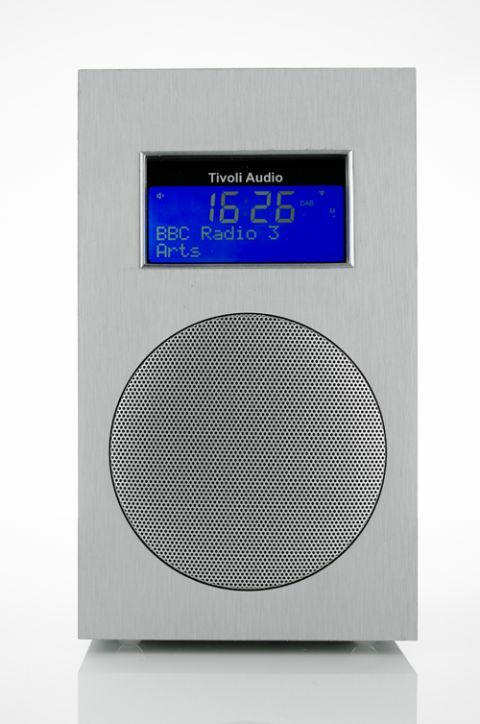 The Tivoli Model 10+ is a stylish looking alarm clock DAB+/FM radio. It’s well made and it produces a suitably impressive sound. What’s more, the Model 10+ is upgradeable to become a stereo unit with the addition of a matching speaker for another £40 (pictured below, not tested along with main unit). You can also add a source (CD player, MP3 player etc) via an auxiliary input. Plenty of options, then. This single unit, though, can be yours for the same price as Tivoli’s smaller offering, the PAL+. For us the Model 10+ is comfortably the better option – unlike the PAL+, it isn’t portable (it needs to be plugged in to the mains) but it sounds noticeably better. That may have much to do with its size. The bigger, 7cm drive unit in the Model 10+ seems more able to take things in its stride, and it deals with both voices and instruments with an easy nonchalance that is appealing. This means it’s targeting the right aspects of the tonal range for a radio, but still it has to be said that there’s a slight muddiness to basslines. This can be somewhat alleviated by a quick tinker with the EQ settings (for treble, bass, loudness and balance), but it never quite quickens those low notes to the pace of the very best. The Model 10+ is a sleek unit, and buttons are kept to a minimum. There’s a rotary control on the top, via which you access all the functions. All other inputs and buttons are on the rear of the unit, including five preset buttons, the auxiliary input and the output to the optional slave speaker. A handy credit-card sized remote control is also supplied. It has alarm functions, so the unit can be used as a bedside device, with dual alarms working via radio or a tone, and an adjustable sleep timer and snooze function. The Model 10+ has a couple of quirks, too: as we’ve mentioned, the five preset buttons (so you get five station presets per band) are on the rear of the unit. This might make for a clean-looking unit, but it does seem odd. And controlling the unit by the single wheel on the top is by no means intuitive. As with anything, the more you practise the easier it gets, but we found ourselves having to think a little too much, rather than just ‘doing’. Ultimately, this is a well-built unit at an acceptable price. Originally priced at £160, it's now dropped down to £100, making it a quite a good deal. It sounds good for almost all radio requirements – especially with the human voice – and you shouldn’t discount the upgradability to a full stereo system that comes with that extra speaker. The Model+ falls down just a touch, though, in ease of use, and that slightly tubby bass means that there are some better-sounding units out there.